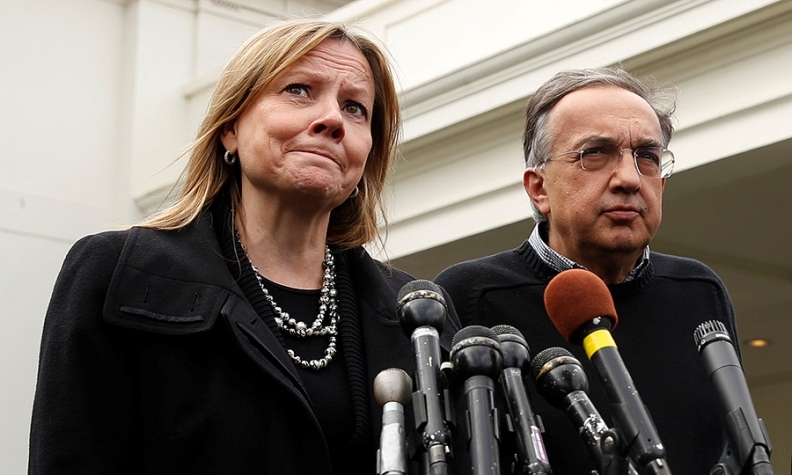 Barra with Marchionne at the White House. GM isn't interested in a merger with Fiat Chrysler or any other major automaker, a source told Bloomberg. Fiat Chrysler Automobiles shares have outpaced General Motors in the initial aftermath of a potential Opel sale, amid fresh speculation the two could combine. The problem: GM CEO Mary Barra still isn't interested. Analysts are seeing GM's proposed sale of its European business creating an opening for FCA to revive its long-standing -- and one-sided effort -- to combine with GM. Shedding Opel would eliminate GM's overlap with Fiat in Europe and clear the way for the largest U.S. automaker to replace money-losing operations with Fiat's profitable brands. While FCA CEO Sergio Marchionne is still open to a deal GM has rejected since 2015, his focus is on meeting financial targets, according to people with knowledge of the carmaker's strategy. GM's Barra, meanwhile, is looking to essentially exit Europe. A sale of Opel will hand PSA more scale and technology, bolstering a direct rival of Fiat Chrysler in Europe and potentially making the company a less attractive merger partner. Since the news broke Tuesday that the Opel division might be sold to PSA, shares in both company have risen. GM rose about 4 percent on Tuesday but fell 0.4 percent on Wednesday. FCA shares rose about 5 percent over the last two days, closing at $11.52 on Wednesday. Notes from analysts including Jose Asumendi of JPMorgan Chase & Co. are likely helping FCA's cause. If PSA Group succeeds in buying Opel, "it would certainly fuel additional M&A speculation, including possibly Fiat taking another shot at GM," Asumendi, who's based in London, said in a note to clients. Automotive News on Tuesday also speculated about such a deal. Even if it loses Opel's 1 million in annual deliveries, GM isn't interested in a merger with Fiat Chrysler or any other major automaker, said a person with knowledge of the company's thinking, who asked not to be identified because the information is private. GM's management believes the company is plenty big enough without Opel and would focus the resources once spent on cars for the European market on new technologies including autonomous vehicles, and on developing fresher products in North and South America and China, the person said. Marchionne, who completed Fiat's acquisition of U.S.-based Chrysler in 2014, has said automakers should merge to become more profitable, arguing that billions of dollars are wasted by the industry on creating multiple versions of the same technology. High costs for developing more energy-efficient cars and adding self-driving features are putting pressure on traditional automakers, which also face threats from new rivals such as Tesla Inc. Unless GM has a change of heart and invites him to discuss a merger, Marchionne is focused on reaching operational targets, said the people, who asked to not be identified because the information is private. At the Detroit auto show in January, Marchionne suggested that President Donald Trump might support a tie-up between Fiat Chrysler and GM, although the CEO later downplayed his statement. Representatives at Fiat Chrysler and GM declined to comment. The sale of Opel would mark GM's exit from Europe after losing about $9.1 billion in the region since emerging from bankruptcy in 2009. That creates a tough hurdle for any deal that would re-expose the company to the region's saturated and mature auto market. Still, selling Opel at least eliminates overlap between the two companies, said Gabriele Gambarova, a Banca Akros analyst. "The move doesn't automatically mean that GM is ready" for a deal with Fiat, he wrote in a note to clients. "But it can create better conditions for a possible tie-up." Marchionne has focused on completing an ambitious business plan that would put Fiat on stronger footing ever since his public courtship of GM in 2015 ended fruitlessly. His targets for 2018 include more than doubling profit and turning 4.6 billion euros ($4.9 billion) of debt into at least 4 billion euros of cash. His efforts have paid off: Fiat's shares have almost doubled in the past year, giving the company a market value of about 16.6 billion euros. Investors have been bidding up the stock as Fiat has reported better-than-expected financial results and expressed higher confidence in reaching its goals. While the share gains have made Fiat more expensive, the company's value is still less than a third of GM's $55 billion.